Net Entertainment (NetEnt) is known for high-quality and unique products developments for online gambling industry. The most creative and innovative projects of the company is in slots category. One of the most popular slot machines to the moment is Gonzo’s quest, and today it is highly popular among different Bitcoin casinos to play for BTC. Gonzo’s quest bright and exciting development about Spanish conquistadors who’re searching for gold and face different adventures on the way. 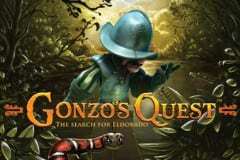 In fact, Gonzo’s quest slot machine is based on legend of Gonzalo Pizarro who spent his time in the expedition to the golden city of Eldorado. This idea adds symbolism to money game, and the developer has implemented a special design concept that leads the player to a big win in the game. Game design is made with attention to ethnic and cultural details of the story. In this case, the abundance of additional elements does not overload the picture, but visual animation makes a long game comfortable. There are few functional buttons here, and it’s impossible to get confused even for the beginner. There’s a button to start at the bottom’s center, and three smaller buttons below: max bet, lines, automatic game. At the left, there’s total bet button, and winnings at the right (multiplier is on the top right). If you play NetEnt, you can navigate here with your eyes closed. If you do not play, you’ll discover everything in a few minutes. It would seem that everything is done here according to the gold standard of online slots. Real surprises begin with the start of the game. There are no familiar game lines in the Gonzo’s quest, but five reels with plates work. If a winning combination comes up, plates fall. In addition to game symbols on plates, there are special ones. A question mark is a joker that turns into the right sign according to current situation (for player’s win, of course). And you will also meet Free Fall, which collapses in a winning combination, and another plate comes into its place. If on the field in three golden lion plates, player receives 10 free spins. The most highlight for a player is the “Avalanche” function: if you get the winning combo, it’ll drop out, and then if other plates here makes new combo, the points are multiplied. And so up to any number, the maximum multiplier is 5. Icons of plates are represented by Indian gods, exotic fauna and flora, waterfalls. Separate attention deserves the protagonist Gonzo, who actively reacts to what is happening in the game. As it was said, the player gets the prize spins for 3 or more special plates in the game. But here it is important to add that the prize spins have much more attractive multipliers: X3, X6, X9 and X15 consistently. The maximum winnings in the game are 750 thousand credits, while the maximum payout size for playing Bitcoin can reach 30 BTC. The size of a single bet is from 1 to 50 credits, with the probability of getting prize spins higher in the case of large bets proportionally. That is, for earnings in the Gonzo’s quest, first of all, free spins are responsible, and their maximum number gives a five-fold drop of a statue on a blue background. Also do not forget to try interesting bonus game. NetEnt created a really fresh slot game, which combines the simplicity of understanding the new concept with the tightening gameplay of traditional linear slots. This is a successful work of true professionals and innovators, which is very popular among casino operators today due to the perfect interface, thoughtful gameplay (maximally interactive as for the slot game) remarkably drawn graphics and a pleasant soundtrack, as well as a high return percentage. Gonzo Quest is an ideal slot of today that worthy of Bitcoin slots fans’ attention. Chose best bitcoin casino for Gonzos quest slot on our website!